Here’s a meme making its way around Facebook these days. All your friends who haven’t done you the courtesy of taking five minutes to find out what you believe think it refutes you. The guy’s a comedian, but I think he actually believes he’s refuted our whole outlook. His deep and scholarly study of libertarianism has led him to the conclusion that we are against rules. So when libertarians play poker, each one presumably decides for himself what makes a winning hand. You thought that full house beat my pair of threes? Not so fast, man! Or libertarian football means teams can have as many downs as they want, and field goals yield whatever number of points they’d like to have. Or when a homeowners’ association says not to build your house in the shape of Hello Kitty, we presumably go ahead and do it anyway. This is ridiculous, of course. Presumably we’d also have to disregard all the rules of language and grammar, and indeed of logic itself. Maybe that’s because we’re not opposed to rules. 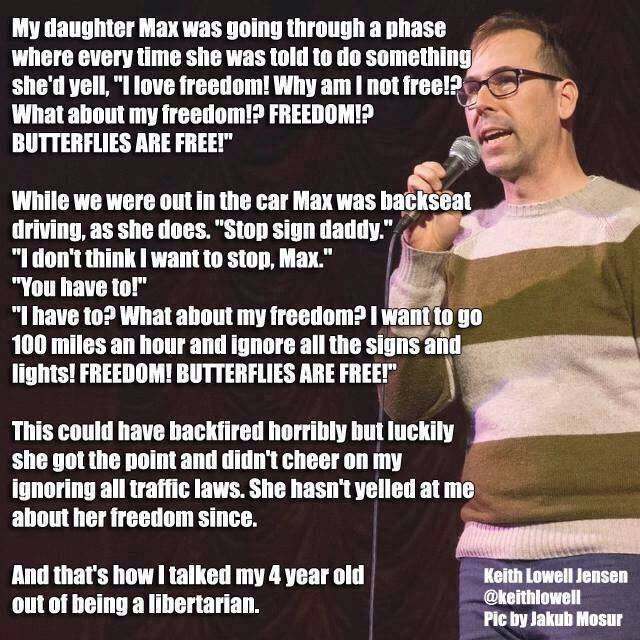 No definition of libertarianism has ever involved opposition to rules. We’re opposed to aggression – the initiation of physical force. And we oppose it whether carried out by a petty thief, or by people in special uniforms waving flags. We’re not even opposed to stop signs, if you can believe it. Any road owner will establish rules of the road for drivers to follow, and be in perfect harmony with libertarian principles. On top of this, he thinks it’s valid to argue like this: my four-year-old wants to do something she shouldn’t, so therefore the government should treat all of us like four-year-olds, forever. Judging from his Twitter feed, by the way, our friend is a conventional left-liberal. There’s a decent chance he opposed the Iraq war, though you can’t be sure, given how unreliable left-liberals are on war. But it’s precisely his attitude toward the state — why, the state knows better than you, you foolish child who hates rules! — that makes awful atrocities like that war possible. The good folks in my private Facebook group — which has the tongue-in-cheek name The Tom Woods Show Elite — pointed this whopper out to me. They’d already sliced and diced it by the time I came along. They’re a great source of sanity and courage in a world of bootlickers. Never feel frustrated, alone, or defeated again. Find your strength in the Elite.